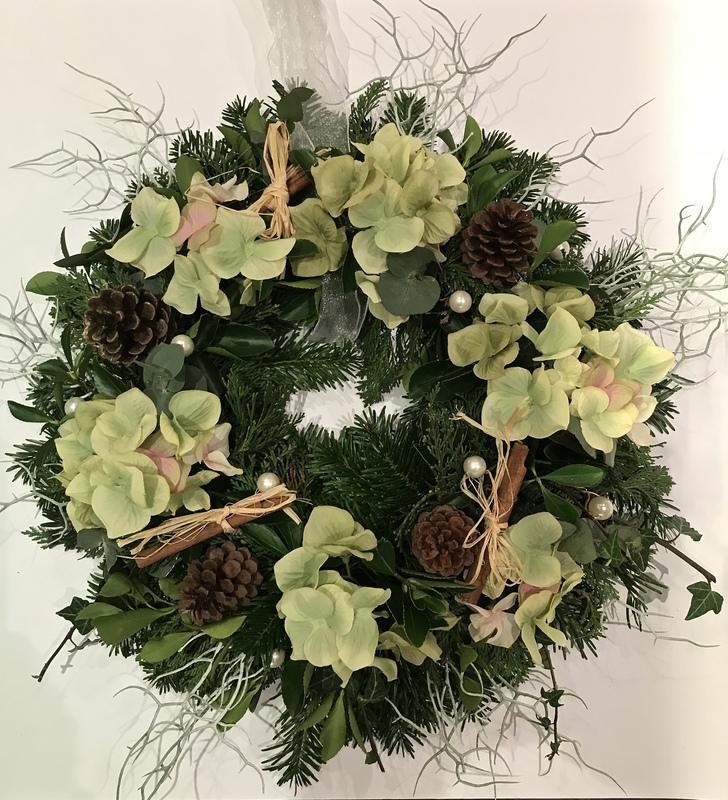 I’ve updated this post with a quick video at the end of the post with the wreath I’ve made recently…. enjoy! It’s my favourite time of year as I get to play and get creative with foliage. Before any decs go up I have to get my Christmas door wreath done and that sparks the beginning of Christmas in our household. I thought I’d share with you my version of a Christmas Door Wreath as it’s not your typical moss based wreath that you can buy. It’s one that allows you to be more creative as you can create a whole number of different looks and styles to suit your taste and doors. It’s also guaranteed to last up until the New Year with no wilting or dropping so you can get on with all that wrapping and prepping. You can also use the same principles to create a fabulous table centrepiece for your Christmas table and I’ve shown this at the end of this post. p.s. Apologies for the quality of my photography, it’s not my best skill and one that I need to learn more about! The wreath has significant meaning for the Christmas. Its circular shape represents eternity, for it has no beginning and no end, representing an unending circle of life. The evergreen, (foliage) most frequently used in making wreaths, symbolises growth and everlasting life. I’ve put a step by step guide to creating your very own door wreath that you can adapt to suit your own personal style and taste. As long as you follow the principle steps, there’s nothing stopping you from creating your own personal masterpiece that will have your neighbours, friends and family swooning over. It’s also a really cheap way to decorate your door with very little cost. Ready to find out how? This wreath ring is 12″ but you 8″ or 10″ rings are good sizes too. Obviously, the bigger the ring the larger the wreath! First up you’ll need to get yourself a wreath ring with a plastic backing. You can buy them here on Amazon or pop into your local florist as I did and grab yourself one. A sharp pair of scissors is a must as is a glue gun (as you can see mines been well used over the past 20 years!) and some florist wires the knife is optional but is great if you don’t want to use your hands to strip the foliage. On average you’ll be looking at about £8 for the ring and wires which if you follow my tips below is all you need to spend on making your wreath and allow yourself a couple of hours to create your masterpiece. Ready to make your wreath? Get soaking your oasis ring in water for a good 5-10 minutes. If you’re unsure if it’s soaked up enough water It should feel relatively heavy and the oasis will change from pale green to dark green. This is important as you won’t want the foliage to dry out and go limp before the big day! TIP: You can pop some holes into the oasis with one of the florist wires to help it soak up the water faster. You’ll also need strong string or ribbon to hang your wreath with. Make sure you place it through the wreath now before you start adding foliage to if you don’t it’ll be rather tricky to add later. It also ensures you know which way up your wreath is especially if you’re going for an all foliage wreath). Foliage for your wreath doesn’t have to cost you any money. 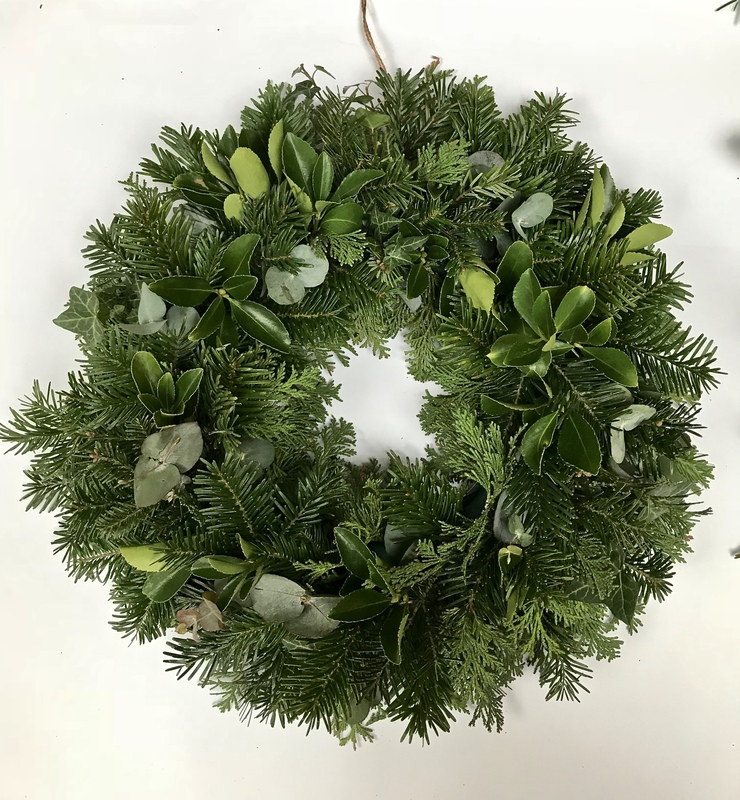 If you have a garden and have conifers, ivy, holly….. basically any evergreen bush or tree with strong stems are perfect for making your wreath. If you don’t have these in your garden ask a friend, family or neighbour who might have. They might even appreciate an overgrown bush or tree being cut for them. Of course, you can buy additional foliage from your local florist. For my door wreath I’ve bought some bronze sprayed eucalyptus, but to keep costs down you could spray your own. TIP: Pop into your local garden centre or anywhere that is selling fresh christmas trees and ask for the pine offcuts. You’ll find they often are free or for a nominal charge. Once you cut your foliage make sure you strip the lower leaves from the stems. The foliage will go easier into the oasis and it’ll be able to drink up the water. If you don’t do this your oasis will turn into a crumbling mess and it’ll be hard to add your other foliage and decorative pieces too. Angle the stem downwards when pushing your foliage into the oasis. The top to foliage should touch the surface the wreath is on. This helps hide the base of your door wreath once it’s hung. Then simply add more foliage working your way around the wreath ring cutting each piece to a similar length. Once you’ve finished the outer edge you need to do the middle using the same process. Once you’ve edged your wreath ring with foliage simply fill out the top and sides using whatever foliage you want. Mixed foliage creates greater interest with their different sized shapes and lengths. Now comes the fun part. You can be as creative as you’d like here and go wild. Or you can choose to keep it simple with natural materials such as pine cones, dried oranges, cinnamon sticks etc. For me though, I like to have fun and try and add a little bit more of a wow factor. I love the creativity of making our door wreath and have experimented with so many unexpected decorative pieces each year. This year I came across these stag heads by Wilkinsons and at £4 for three they’re a bargain. And even if I don’t use them again on my door wreath next year, I can restring them and use them on one of our trees. 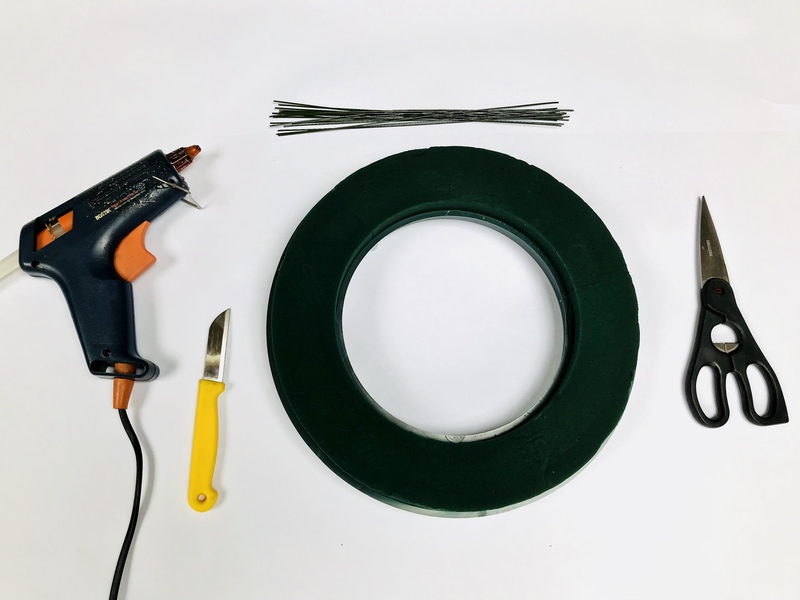 TIP: If you’re looking to try to add decorative pieces to your wreath, ensure there’s something to attach a wire to and/or has a strong stem to push into the oasis. I also picked up these sprays. A bargain at £1 a pop. These can easily be broken down into individual pieces. £1 goes a long way when decorating your door wreaths! Gather your decorative bits together and start placing them on your wreath until your happy with the finished look. Don’t stick anything into the oasis just yet! You want to make sure your entirely happy with the end result! Of course, you could wire you’re pieces as you go, but if something doesn’t work or look right you won’t want to be wasting time wiring them now. I like to wait until I’m happy with the overall look before moving on to the next step of wiring and glueing. Once you’re happy, take one piece at a time and prepare to get wiring and glueing. TIP: I like to use artificial flowers/foliage in my door wreaths, they not only look great but you can reuse them again for other projects once your door wreath is finished. I picked mine up a couple of years ago from a charity shop for a couple of pounds and have reused them again this year. Just pick out your decorative pieces before you discard the wreath ring at the end of the holiday season and you’ve got them for next years! These stag heads where perfect for attaching to my door wreath as they had a small hole for the hanging string. I simply cut this off. You can do this with Christmas baubles too just thread the wire through the hanging hole. And pushed a florist wire through. Heavier pieces like this need a stronger wire to secure it into the oasis. Note the messy hands from foliage stripping. It reminds me of my floristry days where my hands were constantly in a state of disrepair and I always hid them when going out! Twist the ends of the wire to form one stem. You’ll need to cut the wire down if it’s too long and your decorative piece sits too high from the oasis. There’s nothing worse than a floating stag head so using wire cutters, I shortened the wires. Being incredibly careful you need to add hot glue to the wire stem. You then need to work quickly by pushing the stem into the oasis where your piece is going. I can’t tell you how many times, I’ve burnt myself, but as my kids say I’ve got oven fingers so personally, I don’t find it too much of a problem. Once you’ve done glueing and everything is secure. You can go hang!! TIP: To stop your Christmas door wreath from banging against your door once hung just add some blu tack to the back of it before hanging! Now I was feeling very smug with myself after the challenging my photography skills together with making my door wreath until that is I hung it on my door. Within a second of me taking this photo, the string snapped and my wreath took a nosedive and lay at my feet in a huge mess of foliage and broken oasis on our slate tiles. Having learnt the hard way, I’m passing on the knowledge of my misfortune. Never EVER, EVER use old string you found that’s been lying around for god knows how many years. And NEVER presume that because you’ve used string for the past few years and it’s held your door wreath firmly in place that it will this year. So after shedding a few tears and quite a few ***** I had to remake my door wreath from scratch again!!! This time, I used strong ribbon instead of the string so there was no fear of it falling again! 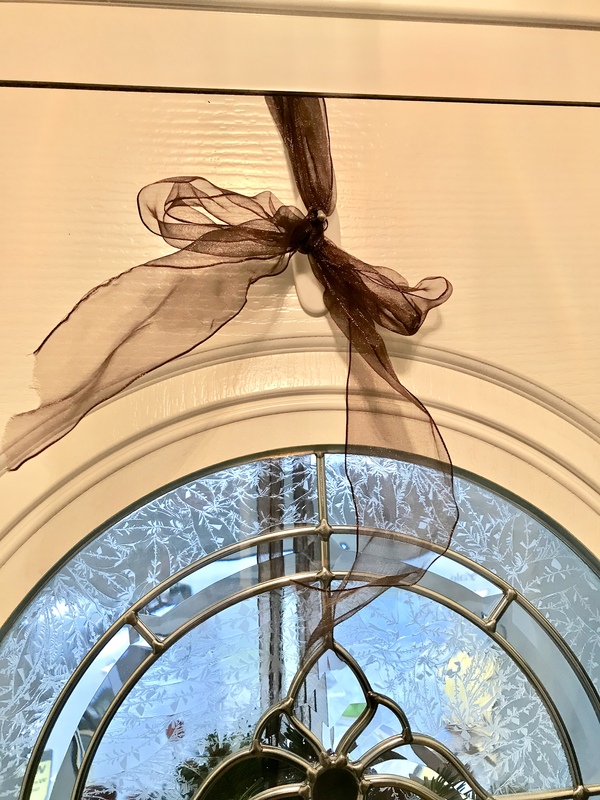 You may be wondering how to attach a door wreath especially if you have a PVC door, this is how…. A simple Command hook stuck to your door the wrong way up and simply attach your ribbon or (strong) string to it. Every year I also make our close friends a door wreath as a Christmas present which also means I get to be even more creative…. What’s great about these door wreaths is that they can also be made as table decorations. Just forget the ribbon or string and this time you may be able to get away with not hot glueing your pieces in depending upon how much it’s going to be moved about. Pop a candle in the centre and you have a beautiful table decoration to last you the whole of December. You just need to top the oasis up with water over a sink or mist spray the foliage to ensure it lasts. Again, you can use fresh flowers but make this a few days before Christmas so it’ll last through to New Year’s Eve! I hope I’ve inspired you to have a go at making your own Christmas door wreaths and if you do, I’d love to see them! I’ll leave you with last years Christmas door wreaths…. The Perfect Duvet For Christmas & Night Owls – The Fine Bedding Co.